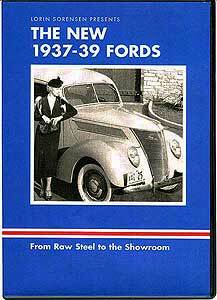 The New 1937-39 Fords DVD by Lorin Sorensen. The 1938 footage includes making Ford tires and plastic parts, assembly lines, comparison of Standard and Deluxe models, interior details, and a visit to the Rotunda to see the full line of models. The Fords, Mercs, and trucks are also shown running on the test track. The beautifully preserved film continues with the 1939 Press preview of new models and includes a very rare series of color ads that include the Deluxe Coupe, Tudor, and Convertible with people driving them to show how sporty and good looking they are.Running time: 60 minutes, black & white, sound. © 1990, 05 Lorin Sorensen. All rights reserved.